Jason’s exquisite wild yeast bread seems so precious a resource that wasting even a crumb is criminal. Stale bread is a marvel of versatility as an ingredient. Dry crunchy old bread can be transformed quickly into crumbs and used as a coating for pan fried chops, as a topping for gratin or a as thickener of sauces. Large pieces of stale crusty bread are refreshed when tossed with chopped ripe, in-season tomatoes, extra virgin olive oil and fresh herbs. We toast slices of fresh country bread and set them in the bottom of large soup bowls where they absorb the rich vegetable broth that is Lidia Bastianich’s Acquacotta. Chad Robertson’s Le Tourin recipe makes use of days-old bread as an absorbent sponge in a hearty vegetable soup topped with a creamy yolked fried egg reminiscent of the Acquacotta. In fact, the simple principle of soaking hard old pieces of bread in a richly flavored broth or sauce to create a meal is universal, born of necessity in less prosperous times. The next time you hesitate to buy the baguette you know you’ll love, or the big round of crusty bread that looks and smells too good to be true, simply because you don’t think you’ll eat it all, remember that the bread you buy today will age into a delicious, nutritious and inexpensive ingredient tomorrow. Breakfast, lunch or dinner, days-old bread and vegetable soup never disappoints. This recipe is a general guide, a statement of technique. You should use whatever veggies you have on hand as well as whatever broth you like. Water works just as well if seasoned properly. 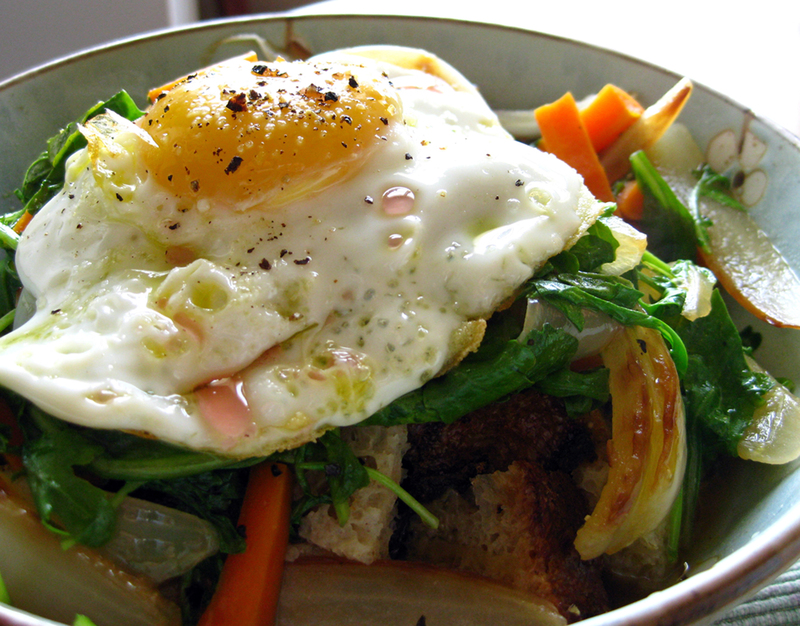 Fried eggs are great, but you could also poach eggs in the soup before spooning the broth over the bread. The drizzle of red wine vinegar over the egg in this dish adds a little zip to an otherwise earthy soup. We used peppery “wild” arugula in place of the kale, but just about any flavorful green will do (beet, chard, collard). 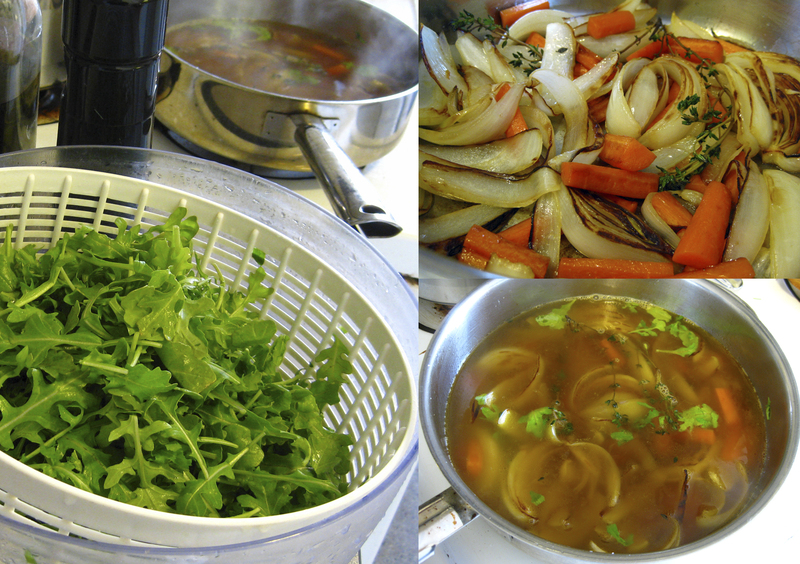 I like to flavor the soup with whole sprigs of fresh herbs that are plucked out of the pot just before serving. Fresh thyme is a favorite. In summer, peeled diced fresh tomato would make a perfect addition as would thin strips of fresh basil scattered over the top after plating. If you want to guild the lily, a fine dusting of grated hard cheese adds a lot of rich flavor to the final dish. A final drizzle of extra virgin olive oil never hurts either! Heat oil in large sauté pan over medium-high heat. Add carrots and onion wedges, cut-side down. Reduce heat to medium and cook without stirring until veggies begin to caramelize, about 5 minutes. Turn to brown the other side and cook an additional 5 minutes. Add greens and broth to the pan, bring to a simmer and cook 10 minutes. Divide pieces of broken bread between two large soup bowls. Spoon veggies over the top of the bread and then ladle broth over the bread. Top with fried or poached egg and drizzle a teaspoon or so of the red wine vinegar over the egg. Dust with freshly grated black pepper and serve. « Older Post Bread	» Newer Post Food Blogger Bake Sale Saturday, May 12th from 10 a.m. to 6 p.m.